A secretive Israeli startup staffed by ex-XIV people is filing patents like there’s no tomorrow. Infinidat is all about object storage for big data, and has EMC Symmetrix inventor and XIV founder Moshe Yanai on its board. The company, whose technology has been described as "XIV done right", has an IZBox G300 filer (NAS) it is selling and is based in Herzliya, Israel, with a US office in Needham, Massachusetts. It has an IZBox website and an Infinidat website. The IZBox is a gloriously well-designed long, long page of eye-candy with a link to a G300 datasheet (two-page PDF). 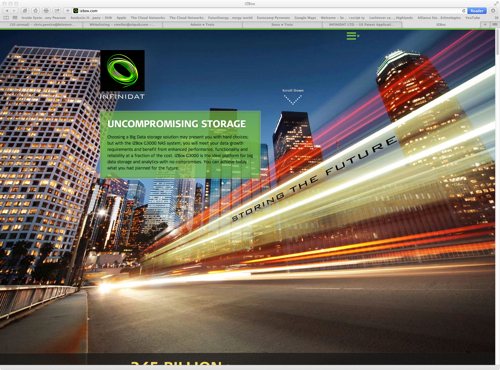 The latter is a one-pager with text about Black Infinity and Green, low-CapEx big data storage. Black Infinity is about “Unmatched intelligent storage capacity at a fraction of the cost of traditional storage” and the amassing of "business data sets so enormous that you thought they wouldn’t be affordable until the distant future". After hearing that we should pay attention to Infinidat we pointed our patented Register search algorithms deep into the warp and weft of the internet - known to informed digirati as “Googling” - and after trawling though billions of web pages followed Infindat’s digital footprints to find out stuff about its staff and technology. Infinidat was founded in 2009 and employs several hundred people. One of its founders was Dr Alex Winokur, a co-founder of XIV and currently at Axxana, another Moshe Yanai-founded company. Sivan Tal - software & systems R & D.
Spin-down disks appear to be used for storing low access-rate snapshot data. Online archive storage at a cost comparable to tape. We understand a more capable product is coming later this year. Infinidat may also be exploring a presence in Utah.